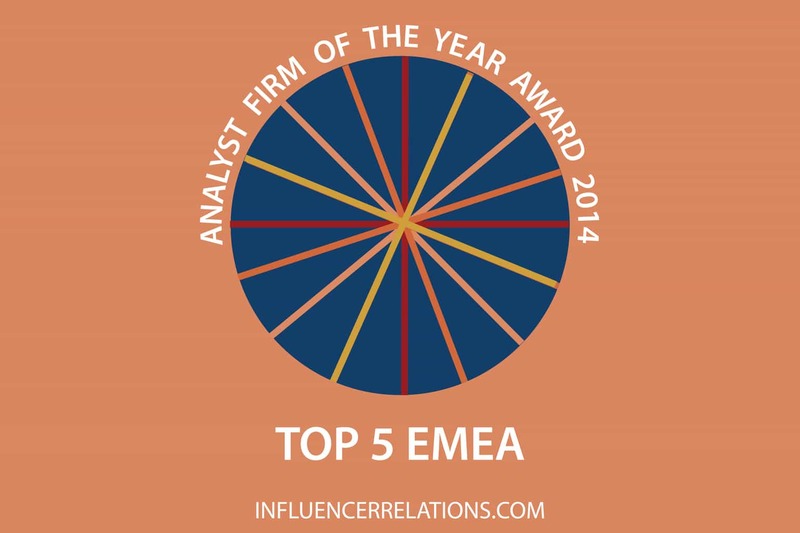 Trends across Europe, the Middle East and Africa vary greatly, but the five firms there delivering the most value in Influencer Relations’ Analyst Firm Awards for 2014 (AFOTY14) are international firms with world-class services. National leaders can be strong, but it’s notable that CXP is the only national leader to get into our top ten. That’s partly because users of analyst research have similar questions in every developed economy, and in developing countries often don’t have the budgets needed to consume a wide range of analyst services. I had an interesting discussion about this with Johan Jacobs, a Gartner alumnus in South Africa who pointed out that few analysts are writing research about Africa. That’s true, but the very limited responses to our survey from Africa suggest that many folk there have questions that don’t necessarily have an African specificity. Indeed, some analyst firms are able to serve a global client base from one major headquarters location, like NelsonHall and Nucleus Research. That said, boots on the ground clearly matter as much as the breadth of services to many customers. That’s what allows NelsonHall to punch at the same weight as IDC and allows PAC to match ISG’s global strength. Gartner: a global leader with an unparalleled roster of EMEA subsidiaries of US clients as well as a notable European client base. HfS Research: a British-led freemium firm whose wide diffusion means its reaching far beyond its client base. Forrester: The global number two, but whose analysts in EMEA typically have a global remit. NelsonHall: a long-established leaders in the massive European services and BPO space. IDC: in many EMEA countries, the only global analyst firm. Everest Group: a business advisory services giant, of which sourcing advisory and market analysis work is a small sliver. Digital Clarity Group: a surprise high entry from another committed freemium firm. CXP Group: the owners of BARC (and now also PAC) but well known as the leading analyst firm in the French-speaking region. Pierre Audoin Consultants: once French, this is a now a global analyst firm whose savvy freemium project has given in remarkable access to top CIOs in Europe. ISG: other services giant, into which sourcing advisory firm TPI was absorbed. I think there are some remarkable results here. Again, we see the incredible reach that freemium strategies are giving analyst firms that want to expand their influence. And we also see some traditional European players, most notably Ovum, squeezed out of the top ten by those firms. This entry was posted in 1. Identify & Evaluate, 3. Engage & Influence. Bookmark the permalink.